Food Critics’ Rating: Max (my 8 year old) gave this dinner two very enthusiastic thumbs up and highly enjoyed left-overs the next day. Finn (my picky 5 year old)…not so much. He ate it with complaints and kept saying “were is the meat part?”. My husband really liked it. 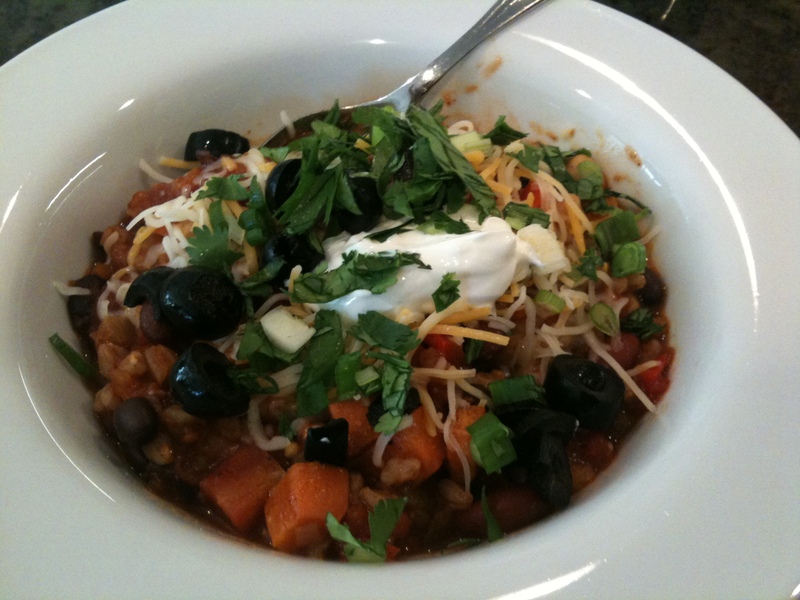 I have seen a lot of vegetarian chili recipes with sweet potato so I wanted to try it in mine. I am the only person in my family who likes sweet potato so I decided to do it on the side and add it to my serving to avoid any complaints. I diced up 1 sweet potato and tossed it with some olive oil, salt and pepper, and roasted it in my toaster oven at 45o degrees for about 25 minutes. 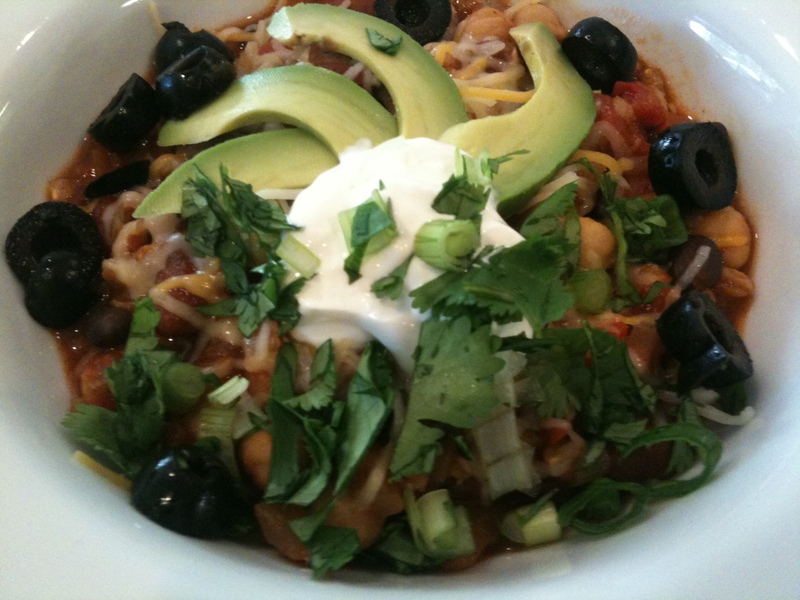 It came out delicious and added a yummy sweetness to the chili. I’m sure it would cook fine if you did it with the chili, but this way the non-sweet potato eaters in the family wouldn’t complain. I love the way it tastes roasted so I would probably just do it this way all the time. 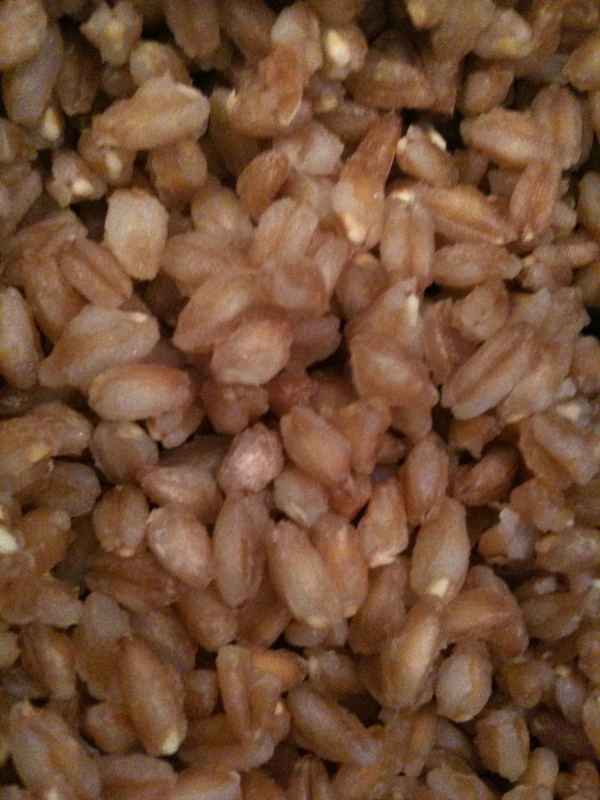 In a small saucepan, cook the farro in 2 cups of the chicken stock. 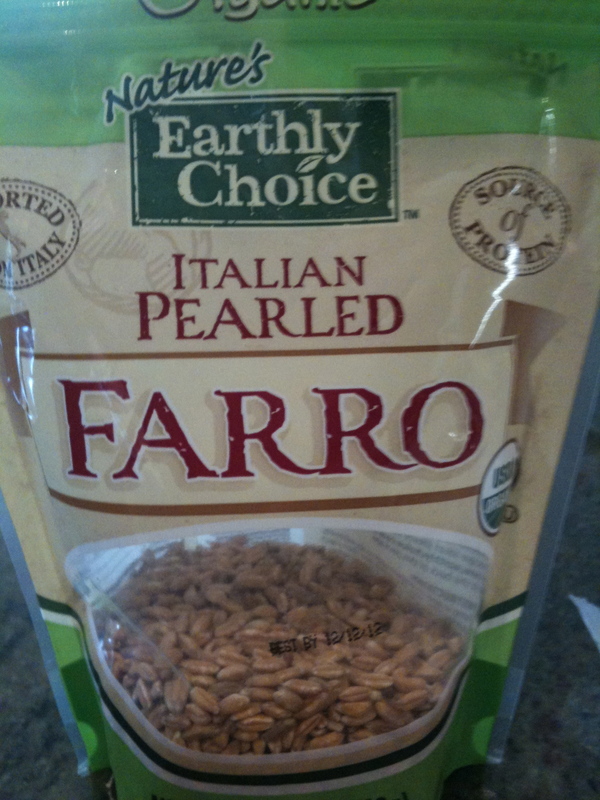 You may need to rinse the farro first – check your package directions. Add farro and stock to pan, bring to a boil, cover and simmer on low for about 15 minutes. Turn off the heat and fluff with a fork. Set aside while you make the chili. In a large Dutch oven, saute the onion and pepper in olive oil for about 10 minutes. Add the garlic and saute for a few more minutes. Add the green chiles, cumin, and chili powder and mix well. Add the chicken stock, tomatoes and tomato paste and bring to a simmer. Cover and let simmer stirring occasionally for about 20 minutes. 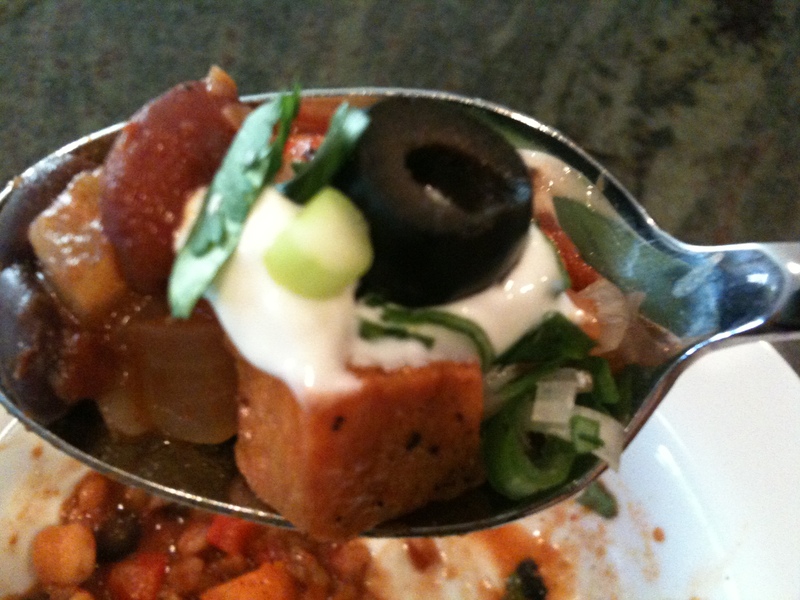 If you want to serve this with the sweet potato you can prepare it while the chili is cooking. 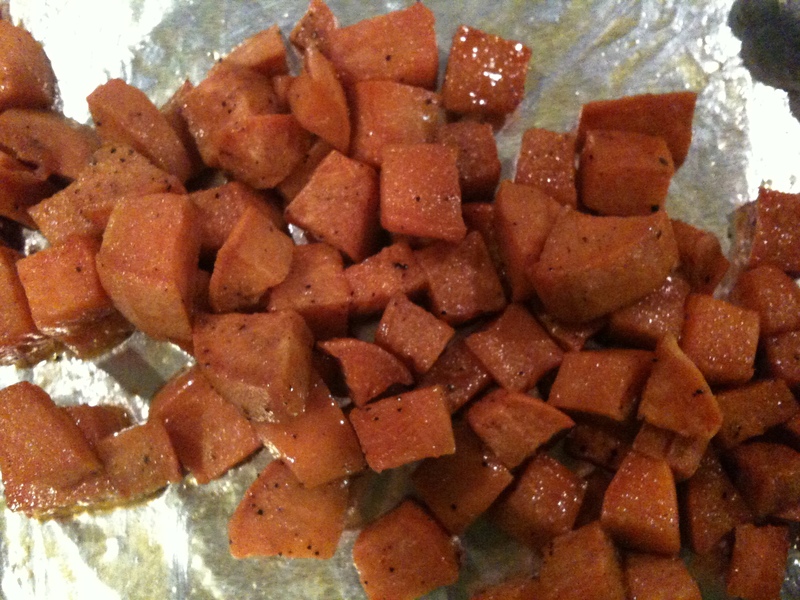 Dice one or two sweet potatoes into cubes and toss with some olive oil, salt and pepper. Roast in a conventional oven or toaster oven at 450 for about 15-20 minutes. 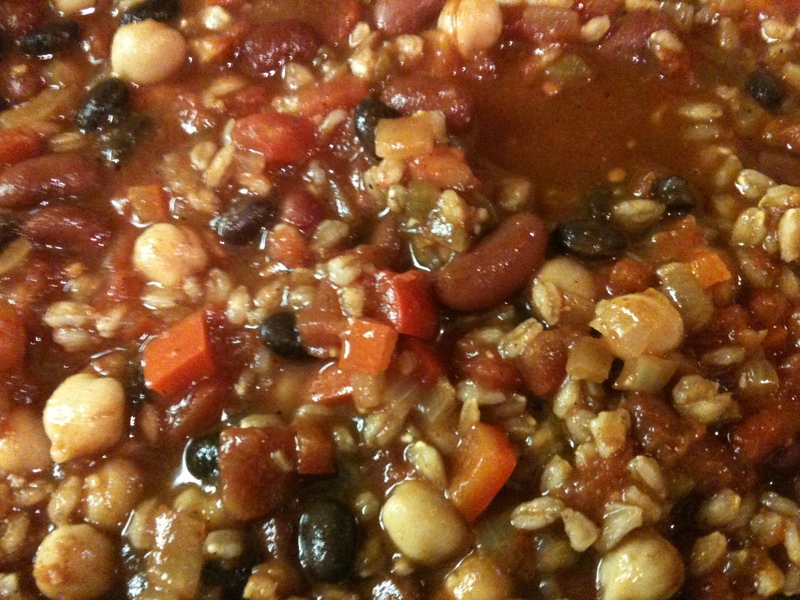 After the chili simmers for 20 minutes, add the beans and cooked farro and mix well. Add a few dashes of Tobasco sauce for some extra heat and flavor, taste to see if you need salt or pepper – depending on how salty your chicken stock is you may not need it…I needed about 1/2 teaspoon of salt. Serve with any or all of the optional garnishes.